Dogs Bite Decatur Al: MILWAUKEE WI - A FAMILY PIT BULL ATTACKED A 3-MONTH OLD BOY THAT WAS LEFT ALONE BY THE MOTHER WITH ITS 8-YEAR-OLD BROTHER AND THE PIT - MOM LIED TO POLICE BUT THE 8-YEAR-OLD SON TOLD THE TRUTH ! MILWAUKEE WI - A FAMILY PIT BULL ATTACKED A 3-MONTH OLD BOY THAT WAS LEFT ALONE BY THE MOTHER WITH ITS 8-YEAR-OLD BROTHER AND THE PIT - MOM LIED TO POLICE BUT THE 8-YEAR-OLD SON TOLD THE TRUTH ! A 3-month-old baby is in Intensive Care after being mauled by the family dog, and the child's mother faces charges. 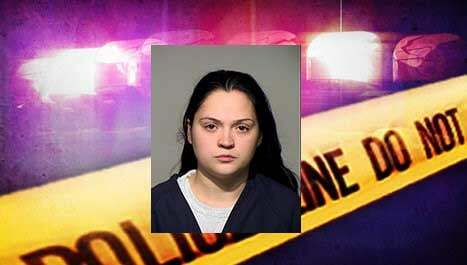 Angelina Lache, 27, faces charges of child neglect and obstructing an officer in the case. According to court documents, the incident was reported Tuesday. Lache was involved in a traffic accident near 16th Street and Rogers Avenue around 9 p.m. She told officers that her 3-month-old son was injured in a dog attack before the crash. The child was rushed into surgery at Children's Hospital of Wisconsin, and is listed in critical condition. Lache gave officers two different stories about how the dog bite took place. Both times, she said she was at a friend's house when their dog attacked her baby. Lache's 8-year-old son, who was in the car at the time of the crash, told officers a different story. According to the criminal complaint, the boy said he and his brother were home alone when his brother started crying. THE FAMILY'S PIT BULL NIPPED THE BABY IN THE ARM, CAUSING THE BABY TO CRY HARDER. THE CHILD SAID THE DOG THEN PULLED THE BABY OUT OF A BOUNCY SEAT, HELD THE BABY'S BODY IN ITS MOUTH AND BEGAN SHAKING ITS HEAD FROM SIDE TO SIDE, EVENTUALLY TOSSING THE BABY TO THE GROUND. Investigators found bite wounds on the child's head, stomach, back, arms and neck. Lache later admitted to leaving her children alone while she went to the store to get milk. When she came home, she saw the baby on his back with a large gash on his chest. She said she put both children in the car and was driving to the hospital when she got into the accident. Lache's older son told investigators that the pit bull, Ace, had bitten two other family members in the past, both resulting in stitches. He told police that his mother lied "to get her friend in trouble," and that she told him "Don't tell the cops the truth, because they're going to kill Ace." “There's no time at all a child should be unsupervised around a dog,” said Karen Sparapani, executive director of Milwaukee Area Domestic Animal Control Commission. Police said the infant is in a pediatric intensive care and is intubated. Lache could face more than seven years in prison if convicted. Ace should have been killed the first time it bit someone. 1. She has kids and brings home a pit bull. 2. Her pit bull bites 2 people, and she keeps said pibble. 3. She leaves her children home alone. 4. She leaves them with a pit bull unattended. 5. Her baby is attacked by the pit bull. 6. She gets in an accident on the way to the hospital. 7. She lies to police. 8. She tells her child to lie to protect the pit bull. Nutters never cease to amaze me in how low they can go. An 8-year-old has more integrity than his mother ever will. Hopefully her children will be taken away. If Ace gets dirt napped, this nutter will get another pit bull. I wonder if she still believes that pit bulls are nanny dogs?